Learn interesting fun facts and trivia about Heat Energy with our fun fact sheets that are especially written for kids. Our fun facts help children to understand how Heat Energy is produced. Children can learn all about this type of energy with our clear definitions, examples, processes and occurrences with different temperatures. Learn the answers to these interesting questions; how does a gas transforms to a liquid? How does a liquid transforms to a solid? We use simple examples to help your kids learn and understand the quick and easy way. Watch the video, its fun for kids and children of all ages and ideal for homework help. Did you know that Heat Energy produced by the Sun is transferred to Earth by radiation? Did you know that Heat Energy causes water to evaporate, condense, melt and freeze? Our fun facts sheets provide definitions and examples of processes and occurrences caused by heat. Fun facts about Heat Energy would not be complete without some pictures! Our universe is amazing, beginning with the Sun which is millions of miles away but maintains the ability to transfer heat energy to our Earth enabling all living creatures and plants to survive. The Earth absorbs heat energy which is transferred from the Sun through radiation. The Sun might be millions of kilometres from the Earth but it does control the temperature of our planet. Our entire universe is made up from tiny particles known as atoms. Kinetic energy is produced when an object moves (when the atoms move). The atoms transfer heat when they move. Heat Energy is also known as thermal energy. This type of energy is transferred from particle to particle which move quicker with the production of more energy. The quick movement causes bonds to break and heat energy to transfer from one atom to another. Heat Energy is transferred in three main ways: conduction, convection and radiation. Definition of radiation: radiation from the Sun travels through electromagnetic waves and produces radiant energy. The Earth absorbs the radiant energy which increased its temperature. Definition of convection: when Heat Energy is transferred between moving gas or liquid particles. Definition of conduction: when Heat Energy is transferred between particles which are different in temperature. E.g. if you place a cold and warm object together, heat will pass from the warm object to the cold object through conduction. 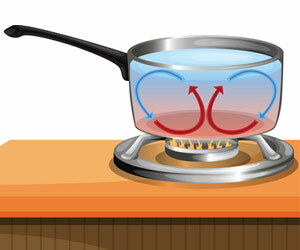 Conduction will continue until both objects achieve the same temperature. Example: If you pour cold milk into a bowl of steaming hot porridge, the porridge will cool down. This is because thermal heat is transferred from the hot liquid to the cool liquid. Example: If you try to pick up something which is hot, such as a metal spoon which has been left in a cup of boiling water, it can be so hot that it burns your fingers - this is because thermal heat is transferred from the metal spoon to your fingers. Heat energy can transform particles from gas, liquid to solid form. Various occurrences take place when temperatures go up and down. E.g. 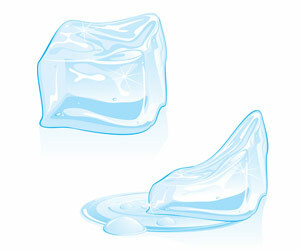 water will freeze at 0 degrees Celsius and it will boil at 100 degrees Celsius. Example: It takes a longer amount of time to heat a swimming pool of water than kettle of water. The more liquid there is, the longer it will take to heat. Heat Energy can transform liquid into gas state. This is known as evaporation or vaporization. Water can evaporate with heat. Heat Energy can transform gas state to liquid forming condensation - e.g. in the bathroom, vapour can change to liquid. Heat Energy can transform liquid into a solid when it is reduced. For example, when water reaches freezing point it turns into ice. Heat Energy causes melting. A solid such as ice will begin the melting process when it starts to absorb heat energy; the ice reacts by changing to a liquid (water). Fun Facts for Kids - Watch the Video! Fast, Fun Facts Sheet and Fun Free Video for kids and children of all ages!